Albuquerque, like most of the rest of the country, celebrated Columbus Day this October 13, 2014. 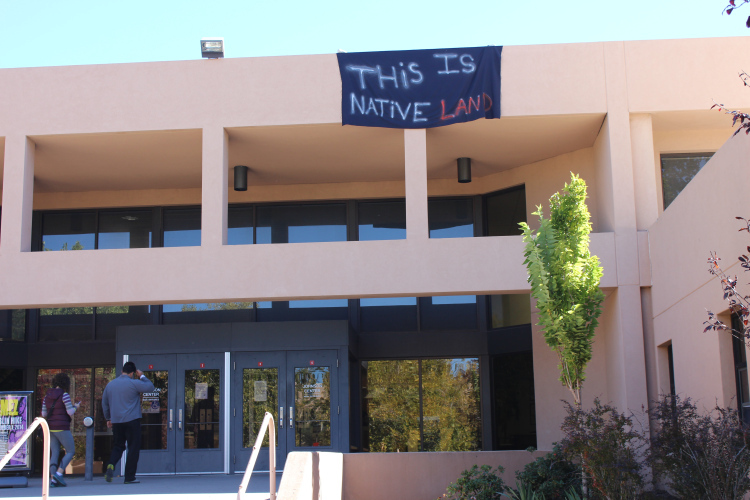 Native students at the University of New Mexico, however, celebrated it as Indigenous People’s Day and organized an “Indigenous People’s Resistance Tour of UNM” as a way to remember European colonization of Native people’s land as genocide and to remind people that UNM sits atop Native land. 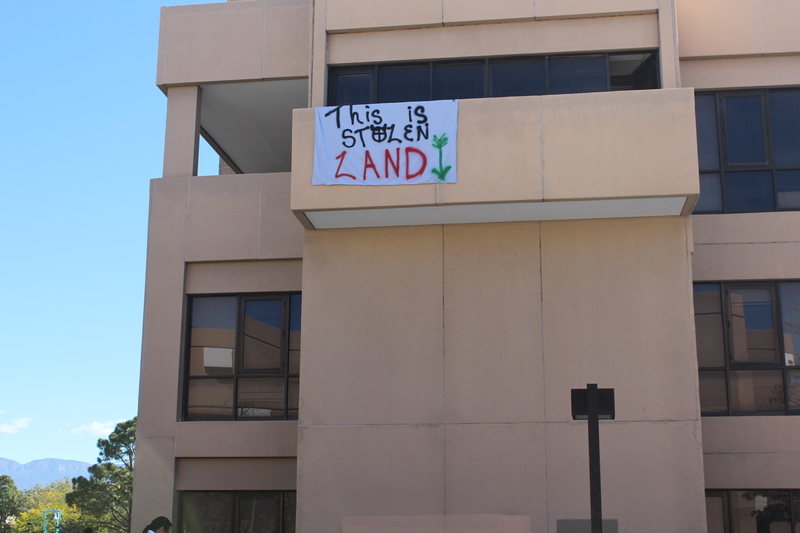 The day began when activists began a series of banner drops on various buildings around campus. Above, students dropped a banner from the Humanities Building. Banners were quickly removed by UNM staff. The one above was dropped above the entrance to the Johnson Center. History, especially Indigenous history, is still a site of struggle in academia, in public education, and in the popular national imaginary. The narrative conventions of U.S. history often create convenient niches for the so-called “Indian Wars” under the umbrella of a “history of the West.” Past atrocities safely remain in the distant past, perhaps unfortunate, but nonetheless in the past. 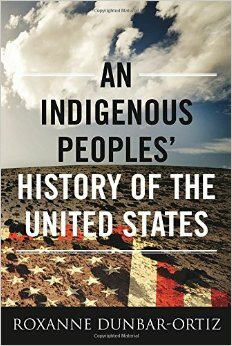 Roxanne Dunbar-Ortiz’s An Indigenous Peoples’ History of the United States derails this narrative. She contends that the genocidal history of the U.S. against Indigenous peoples was not only foundational to bring the nation into existence but required to export it as a global project in the twenty-first century. Indigenous peoples, perhaps the first and longest standing enemies of U.S. empire, remain central to this history of the U.S. and its future. Second, Indigenous resistance is over five centuries old and needs to be re-framed within a broader history of the Americas that does not result in complete annihilation and disappearance. She writes, “Surviving genocide, by whatever means, is resistance.” (xiii) This also means rethinking history from an Indigenous perspective as active participants in shaping their own histories of themselves, the land, and the formations of U.S. colonialism. Revered U.S. presidents from Andrew Jackson to Abraham Lincoln also washed their hands in Indigenous blood. Jackson’s genocidal Muskogee war won him his political career. As president from 1829-1837, he won support from landless, poor settlers to whom he promised land by implementing removal policies for many of the “Five Civilized Tribes” (Cherokee, Choctaw, Creek, Chickasaw, and Seminole) in the South. Killing and hating Indians was not only politically profitable, it was a requirement for office after Jackson. Lincoln’s tenure was no different. Credited as the author of the 1863 “Emancipation Proclamation” and for “freeing” black slaves in the Civil War, his role as a national “hero” is irreparably stained by his treatment of Indigenous peoples. Lincoln won favor with poor white settlers, much like Jackson, with his promises of “free soil” under the 1862 Homestead Act and the Morill Act, which opened up Indigenous land in the West for settlement and “land grant universities.” (140) He also sent Union troops to violently crush the Dakota in Minnesota Territory and expel them from their homelands in 1862; 38 Dakota men were hung in a public display of force. To date, this remains the largest sanctioned mass execution in U.S. history. Lincoln was also president during the 1864 Navajo “Long Walk” where thousands of Navajo were rounded up and forced marched to an open-air concentration camp. “The American Century” also served to continue the process of conquest of Indigenous peoples. A large number of Indigenous peoples served in the military during World War I, even though many were not U.S. citizens. In recognition of their service, citizenship was granted through the 1924 Indian Citizenship Act. Many Indigenous peoples, however, protested citizenship because they had not asked for it. As part of the New Deal, perhaps the most dramatic transformations took place. The 1934 Indian Reorganization Act ended allotment and allowed for tribal governments to become politically organized around a U.S.-based constitutional model. Overwhelming numbers of Indigenous peoples also served in World War II, only to return from service to be met with 1950s termination and relocation policies that promised to end federal recognition of tribes and relocate them off their reservations. Much of the Indigenous resistance to these federal policies fueled the resistance to come in the following decades. The long history of Indigenous anti-colonial resistance, or the “culture of resistance,” from Tecumseh to Crazy Horse, remained (and still remains) in the hearts and minds of many. The post-World War II formation of the National Congress of American Indians, the National Indian Youth Council, and the American Indian Movement (among many other organizations) pointed to a new generation of social movements, some of which also broke onto the world stage at the United Nations. In fact, much of the twenty-point program of the 1972 “Trail of Broken Treaties” nation-wide march to Washington, D. C. served as a framework for the 2007 United Nations Declaration on the Rights of Indigenous Peoples. But many of the achievements of the international struggle came with consequences; the 1973 73-day standoff at Wounded Knee resulted in a violent FBI crackdown. Nonetheless, the vibrant international culture of Indigenous peoples still exists and thrives today. This is a book that should be shared among the Indigenous and non-Indigenous reading public as well as read and taught in college and high school classes. It will serve as a reference point for many scholars and activists to come. Raising Standards at UNM: A Path to Excellence or Academic Apartheid? 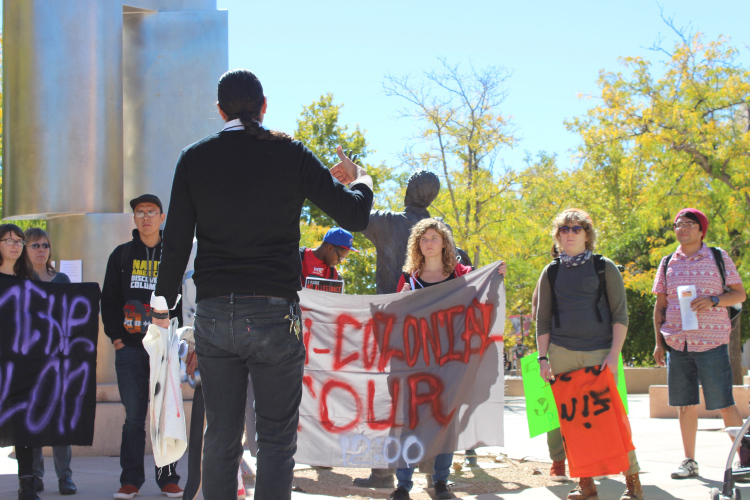 Raising Standards at UNM: A Path to Excellence or Academic Apartheid?.